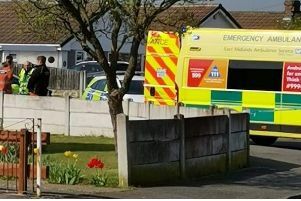 The resident alleges that the motorcyclist was riding an unlicensed motorbike and not wearing a crash helmet. The resident continues : "He was riding on pavements as well as the busy main road, weaving among the traffic from one side of the road to the other. "Need one say anymore about the state of society today?" "Being used or pushed on a road or the footway adjacent to it. "Being used off-road on footpaths, in parks, car parks, on common land or at any other location where the public have access." The incident happened on the same day Nottinghamshire police's off road team targeted the Ashfield area, in response to calls from members of the public with regard to off road motorbikes and anti social behaviour. A statement from Ashfield's Policing team said: " These operations are planned for the next year, and will be paying more visits to Ashfield in the near future. "Areas visited by the team yesterday were Export Drive, Huthwaite, The Coxmoor estate and surround area, Annesley, and Felley Woods, heading down towards Hucknall. "We encourage members of the public to keep calling the police with regard to motorcycle nuisance and in particular off road vehicles, so that we can target specific areas. "Please call 101 or Crimestoppers 0800 555 111"